The agricultural sector is one of the main land users in Europe and thus shapes landscapes in rural areas. It has various direct and indirect impacts on the environment and depends itself on natural resources. Patterns of agricultural production vary considerably across Europe and no general picture can be drawn. Emissions from agriculture arising from, for example, the use of fertilisers and pesticides, have decreased recently. However, the pressures from agricultural production on the environment are still high in several regions of the EU. The primary function of agriculture remains food production, but it also contributes to, for example, energy production. Considering both agriculture's contribution to food production and its externalties, it has a key role to play in achieving the UN Sustainable Development Goals — in particular those related to ending hunger and food security and the sustainable use of natural resources. Agriculture in Europe is challenged by — among other things — land take, leading to a reduction in agricultural land, and climate change. 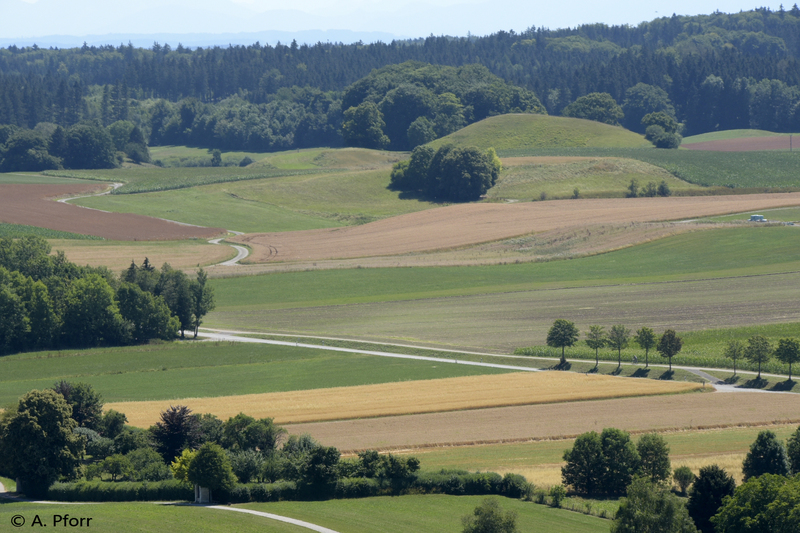 Agricultural land plays an important role in land use patterns across the EU. Grass- and cropland together make up 39 % of Europe's land cover (EEA, 2017a). However, the utilised agricultural area (UAA) as a share of total area varies between EU Member States — from around 60 % in Denmark to around 7 % in Sweden and Finland (see DG AGRI, 2017, data from 2013). The agricultural sector is a major user of natural resources and has a complex relationship with the environment (OECD, 2017). The early stages of agriculture expanded with the adoption of a sedentary lifestyle, crop plants and husbandry with as the Neolithic culture spread in Europe from around 6500 BC in Turkey and around 3000 BC in Scandinavia (Küster, 1999). It has shaped the cultural landscape ever since. Over time, many factors, including environmental conditions, societal demands, economics, politics and innovation, have driven the development of the agricultural sector and subsequently the scenery in rural areas (Box 1). Agricultural production also influences people's lives and the environment. Agriculture provides public and private goods — both material goods and intangible externalities (Vejre et al., 2007). These can also be classified into consumer products and production products (Köster, 2010). The latter include raw material for food, fodder and energy production. For millennia, agriculture in central Europe was based on a small number of crops and domestic species, resulting in economic instability. With the modern era the inventory of crops increased. Until the Middle Ages, rural settlements supplied themselves with food. It was, therefore, necessary to produce every type of food produce everywhere. However, improved transport opportunities allowed specialised agricultural regions to develop, a trend frequently supported by the aim of producing surplus for trade. Storage capacity and the distance to cities — consumer centres — were two determinants of what was produced. Close to the urban areas, mainly perishable foodstuffs were grown. In the 20th and 21st centuries, land reforms led to increasing field sizes and a reduction in hedges. In the middle of the 20th century, maize, which can grow on wetter land otherwise only usable as grassland, was introduced from America. Due to its short vegetation period, cultivating maize increased the problem of erosion. The introduction of maize was also revolutionary, as it served as a fodder plant and allowed animal farming to become independent of the available area of grassland. In the second half of the 20th century, there was considerable overproduction in the EU. In the 1970s this led to 'social fallows', frequently owned by part-time farmers and mostly expected to become either building land or low yielding, unprofitable agricultural land. With the decreasing proportion of farmers in the villages (see also Figure 2), streets becoming asphalted and pavements established, there has been little space for the weeds typical of agricultural regions, such as comfrey, catnip and the herb Good King Henry. Sometimes geraniums imported from South Africa have helped shape the picture. This continuing development of the agricultural landscape, driven by many factors, makes it difficult to define the classic cultural landscape for any given region . There are many parameters used to characterise the agricultural sector. Figure 1 provides an overview of the area of crops cultivated across the EU. More than 50 % of the arable land in the EU-28 is used for cereal production (Eurostat, 2017a). However, farming structures vary significantly across Europe and even within countries, and so the positive and negative impacts on the environment vary. These range from (semi-)subsistence farms to large-scale farms, and include land-less animal production farms as well as organic farms (see photo series). Figure 2 shows how the around 10 841 000 farms in the EU (DG AGRI, 2017, data from 2013) are distributed by size class, taking the UAA as reference point. Farm size alone is not indicative of the intensity of farming: for instance, a large organic farm or Alpine alp may have a smaller environmental footprint overall than a small intensive vegetable producer. CO2 emissions from peat soil drained for agriculture make up 100.5 Mt CO2 per year. For forestry these are 67.6 Mt CO2. With a total of 173 Mt CO2 emissions from drained soils, the EU is the second largest hotspot for peatland CO2 emissions (after Indonesia) (Berge et al., 2017). Through irrigation, agriculture is a major pressure on renewable water resources. Seasonally, the sector consumes more than 50 % of the water used in Europe. Agriculture contributes 25 million tonnes of oil equivalent to renewable energy production (2015), which is 12.3 % of the total renewable energy production. This production increased by 15 % from 2013 to 2015 (DG AGRI, 2017). Agriculture is an inherent part of food systems, and the range produced in the EU is diverse. This list of selected features of EU agriculture suggests that the concept of multifunctionality, in the sense that primary production is considered to have one main function (production), and related joint production (see Vejre et al., 2007) is important when describing the sector. The performance of the sector is critical to the achieving sustainability goals (see below), as, for example, compared with sealed land it provides more ecosystem services, but it also causes environmental problems. Two of the main challenges confronting agriculture in Europe are climate change (EEA, 2017c) and land take, i.e. the conversion of land to, for example, settlements and infrastructure (EEA, 2017a). Climate change requires the adaptation of crop varieties and causes extreme weather events , and thus it demands profound risk management. Land take leads to a reduction in agricultural land in many regions (see below). The development of the agricultural sector is strongly influenced by the EU's common agricultural policy (CAP) (see Köster, 2010). However, energy and climate policies, for example, have also driven the increase in energy crop production over the last decade (OECD/FAO, 2017). The CAP is a complex policy system that has evolved through a series of reforms (Cunha and Swinbank, 2011). For a review of the development of the CAP over recent decades, see European Parliament, 2017). Box 2 provides an overview of the agri-environmental components of the CAP over the funding period 2014-2020. Assessing the influence of policies on landscape requires a solid understanding of the laws of cause and effect (van der Sluis et al., 2015). Yet, the importance of CAP payments for the development of the agricultural sector becomes obvious when looking not only at its proportion of the overall EU budget, which is 37.8 % of the EU multiannual financial framework for 2014-2020 (EC, 2013) , but also at the share of payments in the agricultural factor income, which indicates farms' dependency on public support. For the period 2010-2014 the average share of EU subsidies in agricultural factor income  made up more than 35 %, and direct payments to farmers 28 %, reaching from shares more than 90 % (subsidies) and around 45 % (direct payments) in Slovakia, and around 15 % and 12 % in the Netherlands (EPRS, 2017). Agricultural production is also framed by other EU and international policies, some of which, e.g. the Nitrates Directive and the Water Framework Directive, are already reflected in the architecture of the CAP. Furthermore, the sector plays an important role in achieving the objectives of the EU's Biodiversity Strategy and the UN Sustainable Development Goals (SDGs). Despite the development of the agricultural sector depending on many factors and the nature of the sector varying regionally, some key trends at the European level can be observed. The proportion of total land accounted for by agricultural land is shrinking, and the sector is affected by land take, i.e. transformation to artificial land. Independently of this, the number of farms is decreasing and the average farm size increasing (Figure 2). Among the reasons for this consolidation are structural and technological changes in the agricultural sector, meaning that production takes place in fewer, larger and more capital-intensive farms (EC, 2016a). At the same time, agricultural land is falling fallow, because farming in marginal areas is being given up, mostly by part-time farmers. However, the reduction in UAA was only –0.3 % per year between 2010 and 2015 compared with –0.8 % per year between 2005 and 2010) (EC, 2016b). Not only do the average yields per hectare increase over time, but there is also an increase in resource-use, e.g. nitrogen, efficiency. New technologies, such as those used in precision farming, frequently supported by satellite data, e.g. from Copernicus, may contribute to this trend. However, although “sustainable intensification” can be observed, emissions from agriculture are still high (see above), and more ambitions, e.g. in the field of targeted fertilisation, are needed. Furthermore, a steady increase in organic production, which is likely to reduce pressures from agriculture on the environment, can be observed. From 2012 to 2016, the proportion of the total UAA within the EU farmed organically rose from 5.6 % to 6.7 % (Eurostat, 2017b). Not only have interventions created incentives, but the demand for organic produce and the volatile markets for many conventional agricultural products have also encouraged the change from conventional to organic farming. In recent years, the agricultural sector has been increasingly affected by extreme weather events, such as hail, heavy rainfall, floods and droughts, induced by climate change, leading to reduced yields (EEA, 2017c). Discussions on the CAP post 2020 have already started, and several stakeholders point to the crucial role of the delivery of public goods and results-based agri-environment schemes. Hence, under such schemes, payments are primarily made for achieving set environmental targets. They are currently offered in only some Member States (ENRD, 2016). Contributing to the UN SDGs will also be important, as well as the goals of COP21. It remains to be seen how the focus on public goods and SDGs will manifest itself in policy design  and subsequently in patterns of agricultural production. Other influencing factors, including climate change and market trends, will also be important for the development of the sector and thus shaping the landscape in rural areas (see Box 1). Due to the effects of globalisation, prospects for the EU agricultural sector have to take into consideration trends in the markets (including oil) and subsequently demand and supply of food and fibre and agricultural production patterns. While biofuel support policies have strengthened the global demand for maize, sugarcane and vegetable oils over the last decade, these factors will influence global demand for agricultural products to a smaller extent in the coming decade (OECD/FAO, 2017) and overall, the FAO/OECD Outlook projects that across most commodities, the growth in total demand (including non-food uses) will slow considerably compared to the previous decade, a major exception to this trend being fresh dairy products (OECD/FAO, 2017). Steadily growing world demand and affordable feed prices should favour the livestock sector. Therefore, the EU dairy sector is expected to expand, including in response to increasing demand in the EU (EC, 2016b) and, globally, most notably in India (OECD/FAO, 2017). However, EU meat consumption is expected to decline, although beef and pig meat production will slightly increase due to exports (EC, 2016b). Maize production is also expected to increase (EC, 2016b; OECD/FAO, 2017), while there will be a shift from rapeseed production to soybean (EC, 2016b). This reflects the trend towards an agricultural sector less oriented to producing biofuels and extends protein crop production. There has been a major reduction in crop land and more is projected for the EU as a consequence of urbanisation and afforestation and re-conversion of crop land to permanent grassland. This trend will be less pronounced over the next 10 years than during the previous decade (OECD/FAO, 2017), and land take is expected to slow down. Although in recent years there has already been a slowdown in the reduction in UAA (see above), this trend is expected to continue, though at a slower rate (–0.2 % per year between 2015 and 2026). The main reductions are in fallow land area: –1.1 % compared with –4.5 % per year in the previous decade); and oilseeds area and other non-cereal arable crops: both –0.8 % per year). The share of permanent grassland is expected to remain stable (EC, 2016b). The number of farms is expected to decline further (EC, 2016a), leading to a trend to larger farms. Overall, the total non-CO2 greenhouse gas emissions from agriculture are expected to decrease by 2025 (–1 %) compared with the reference year 2008, but greenhouse gas emissions per hectare are expected to increase (+2 %). This is linked to the intensification of arable crop and fodder production, as well as of animal production, on a decreasing total UAA. Ammonia emissions are expected to decrease (EC, 2016b). Conceptually, the CAP is divided into two pillars: broadly Pillar 1 covers agricultural income and market support and Pillar 2 rural development. c) Agri-environment-climate measures, in which farmers can participate voluntarily and are paid for costs and income foregone related to demands which go beyond cross-compliance and greening obligations, e.g. for not using pesticides. Further measures under Pillar 2 that are potentially relevant from an environmental perspective are, for example, support for organic farming, areas with natural constraints and management of Natura 2000 areas. In the current period, the architecture of 'green payments' devoted to agri-environmental measures in the broader sense changed compared with former periods with the introduction of 'Greening measures' under Pillar 1. 30 % of the budget for direct payments is allocated, which is available to eligible farmers when following the greening obligations. The CAP 2014-2020 is said to be 'greener and more market-oriented than in the past' (EPRS, 2016) with more subsidies bound to compliance with environmental obligations and fewer coupled to producing certain products. However, a recent report (OECD, 2017) questions how far the design of the CAP 2014-2020 really leads to more agricultural land under environmental conditions. Some results of the greening measures on land use patterns are already visible, e.g. the production of nitrogen-fixing crops, which pull nitrogen from the atmosphere and make it accessible to plants, as Ecological Focus Areas (EC, 2017). But there are doubts that the new greening measures' will have additional effects in maintaining biodiversity. The impacts of greening measures on the environment can only be assessed many years from now. More information will be needed to adequately assess the effectiveness of these measures (ECA, 2016). Unless indicated otherwise, based on Küster (1999). For further reflection on the possibilities and challenges of defining classic cultural landscape, see Tieskens et al. (2017). For further information on climate adaptation, see the EEA's work in this field or the Climate-ADAPT Platform. These figures correspond to EUR 408 billion. Pillar 1 has a budget of around EUR 313 billion, and Pillar 2 EUR 96 billion (in 2013 prices, and without considering Member States shifting between the pillars (EC, 2013). A review of the CAP design 2014-2020 finds that the current policy mix that combines production-oriented support and area-based support with support to the transition to environmentally friendly practices can be adapted to reinforce the capacity of agriculture to deliver beneficial environmental and climate change outcomes. Future CAP reform should continue the long-term trend to increase the share of producer support with constraints (OECD, 2017). Considering this, integrating the SDGs into agricultural policies may not require a significant redesign of the CAP. For references, please go to https://www.eea.europa.eu/themes/agriculture/policy-context or scan the QR code.